This item is a set of 19pcs table card stands, which is a simple way of marking the tables at your reception. 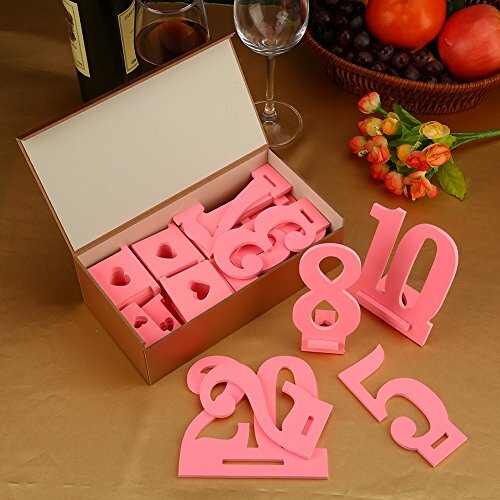 It includes 1 to 19 shaped numbers for seating assignments. It has a oval base, which can be easily put on the guest tables. - Size: 12 * 12cm. - Set of 19pcs table card stands. Nice table numbers or seating assignments. It is quite easy to inserting the table number inside the durable base.Comes with oval base,easy to place on the guest tables,sturdy stand on, not easy to falling dowm. It is perfect for wedding reception, charity ball, Christmas party, birthday party, catered events,banquets,competition etc,anniversaries, meeting,etc. 100% MONEY-BACK GUARANTEE, We promised to send you replacement or money refund if you are unsatisfied with the product. If you have any questions about this product by Furniture Life, contact us by completing and submitting the form below. If you are looking for a specif part number, please include it with your message.